UNCASVILLE, Conn — Darius Rucker is a regular act at the Mohegan Sun Area, but the performance of Immaculate-Danbury’s Darrius Smith and Darius Hunter in the Class S boys’ basketball championship here Saturday may have one-upped the former Hootie and the Blowfish frontman’s best show. Smith (21 points) and Hunter (16 points) carried the top-ranked Mustangs to a 53-43 victory over 11th-seed Coginchaug in front of 5,000. 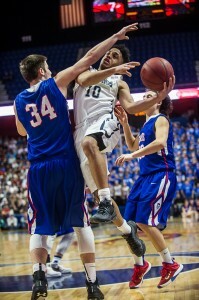 Smith, a quick 5-8 guard, and Hunter, a 6-foot swingman, gave Coginchaug fits with their athleticism. The 25-3 Mustangs, who lost only to Class LL semifinalist Danbury and Class L quarterfinalist Pomperaug, led for good after closing the first quarter with a 7-0 run. Two Smith layups off of steals fueled the early spurt for Immaculate, which is 3-3 in title games, winning for the first time since 2012. Coginchaug (17-9) is 1-3 in title games, winning in 1974. Smith’s steal and lefty finish on a layup gave Immaculate a 15-9 lead early in the second quarter. Smith scored eight points in those eight minutes to to give the Mustangs a 27-18 halftime lead. Coginchaug took advantage of Hunter’s foul trouble and battled back with a strong third quarter when Jacob Sapia scored three straight hoops to cut the gap to 33-31 with 1:41 left before the Mustangs took a 35-31 lead into the fourth. Cameron Powers’ 3-pointer early in the fourth cut the Immaculate lead to 35-34, but Hunter answered with a three to up the lead back to four. Immaculate proceeded to pull away, effectively utilizing a spread offense and capitalizing on offensive putbacks on two missed free throws. Smith hit a layup, then hit William Hatcher on an inbounds pass for a banker to give the Mustangs a 43-36 lead with 2:38 left. Hatcher, a 6-4 forward, converted a putback off a Smith missed free throw to up the lead to 46-36. Immaculate shot 50 percent from the field (19 of 38). 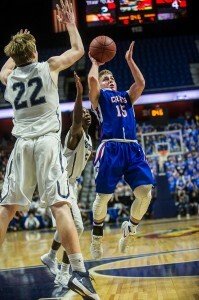 Powers (12 points) and Sapia (11 points) led Coginchaug, which made seven 3-point shots. After losing in the Shoreline Conference tournament quarterfinals, Salva is proud of the way Coginchaug responded in Class S.